Project obstacles and solutions: In 2014, the international agribusiness corporation, Tate & Lyle announced it would expand its two starch and corn sweetener processing plants in Lafayette, Indiana. The $99 million renovation was designed to add considerable space for grain storage. RL Turner was selected as the general contractor for the renovations. 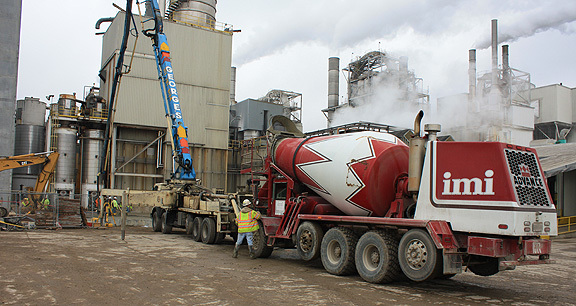 The challenge on this job was to provide a concrete mix that could be pumped onto the job site and was workable for the crews, but would also set up quickly. The springtime temperatures were fluctuating between the mid 40s - low 30s. IMI QC/QA designed a mix that used a mid-range water reducer. This produced a 4,500 psi, 5 inch slump mix that was easy to pump and place. However, the mid-range water reducer also sped up set times. Standard concrete would take up to 12 hours to set at 40 degrees. The IMI mix delivered to the site set up in less than 3 hours. For more information on accelerating set times, contact the IMI sales representative for your area. Click here.